You're never too old for adventure… or fine art! 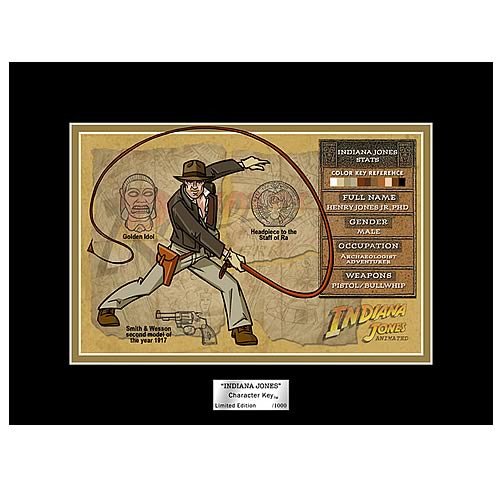 This Indiana Jones Character Key features an animated version of Indy cracking his whip. Also displayed are images of the Golden Idol, the headpiece to the Staff of Ra, and his Smith & Wesson. This marvelous key is reproduced on a clear, acetate cel that "floats" above the illustrated backing board. The matte measures 6-inches tall x 8-inches wide, and the artwork is approximately 4-inches tall x 6-inches wide. The edition number is printed on a metal plaque. This attention-grabbing character key is a limited edition of only 1,000 pieces, so you better crack the whip and order one today!